On an all but empty stage (with the exception of two pale green wooden chairs and a black curtain backdrop), solo performers gather to convincingly depict a myriad of characters, retelling animated experiences for a brief preview of the Lost Theatre’s second Face to Face Festival in South West London. Hosted by Claire Dowie, the evening features exerts from award-winning acts by Stephen Oxley, Louise Wallinger, Ivor Dembina, Jack Klaff and Dowie herself. A grey-haired Dowie takes on the role of a matured pre-teen tomboy, clad in a navy uniform blazer, white button-down blouse, stripped tie and that ever constricting black knee-length skirt. In an honest and amusing monologue, Dowie comes to terms with gender roles and sexuality in Why is John Lennon Wearing a Skirt? Her innocent demeanour and naiveté as she describes “the knicker factor” and the way in which her “fab four” troop go about challenging boys is telling, reflective of an age come and gone. Her physical comedy generates laughs and opens your mind to the forgotten details of coming-of-age. With the microphone stand in one hand, held vertically to illustrate the main gun of an army tank, Dembina’s This is Not a Subject for Comedy recounts the lighter side of doing peace work for Palestinians on the West Bank in Israel. Interspersed with anecdotes from his Jewish upbringing, retold from the point of view of child and adult, this performance is marked by humorous impressions and addresses cultural differences at home and abroad – perhaps the most promising piece of the night. Although somewhat difficult to follow at times, Klaff narrates two separate tales with intensity, fervour, and minimal wardrobe changes in Out to Lunch and Newton. The latter has Klaff impersonate a handful of diverse characters: from Sir Isaac Newton to Robert Hawke, Samuel Pepys to Albert Einstein, each performed with a distinct voice and behaviours, all pleading Newton’s case. This exhibit of wide-ranging acts that the Face to Face Festival has to offer is only a sample of performances that are sure to make you laugh, think, relate and appreciate the ingenuity that is solo theatre. 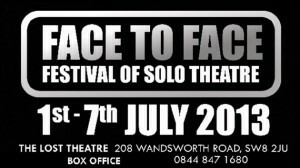 The Face to Face Festival is on at the Lost Theatre from 1st to the 7th June 2013, for further information or to book tickets visit here.